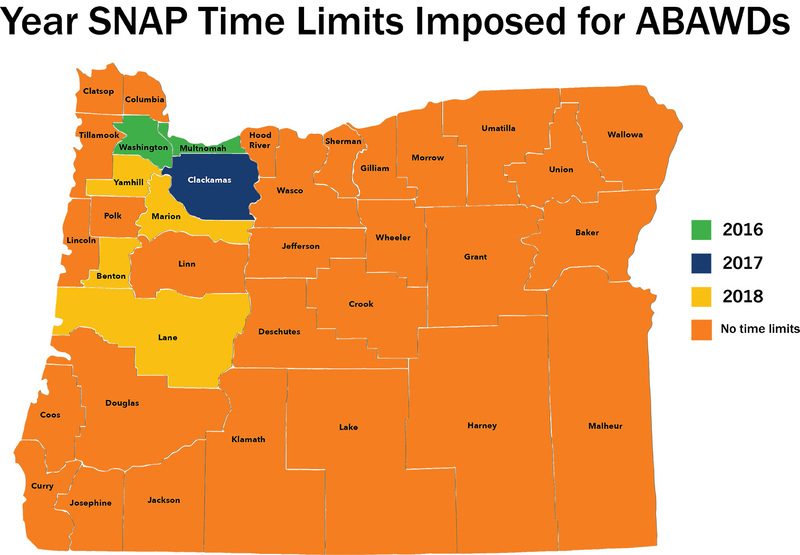 Harsher SNAP time limits will hurt Oregonians. Here’s what you can do to resist. Everyone is better off when people facing hard times have access to food. Unfortunately, we are hearing signals that President Trump and Congress will be proposing to cut even more people off food assistance. We have seen over the last few years an expansion of restrictions on food assistance for Supplemental Nutrition Assistance Program (SNAP) recipients labeled as “Able-Bodied Adults without Dependents”, or “ABAWDs”, which are defined as childless adults ages 18 to 50. This was triggered by the 1996 “Welfare Reform” law that tied time limits on SNAP to unemployment rates in counties. These restrictions limit eligibility for food assistance to three months within a period of three years unless they meet an exemption or are able to obtain and maintain 20 hours a week of employment or work activities. In 2016, at least 500,000 low-income individuals nationwide lost food assistance due to these restrictions. In Oregon, we have seen these restrictions expand across our state. Starting in 2016, these time limits came into effect in Multnomah and Washington Counties. Clackamas County followed in 2017. In 2018, restrictions were added in Yamhill, Marion, Benton and Lane Counties. There are currently over 16,000 Oregonians across these counties that could be subject to these time limits. As of April 1, if individuals fitting ABAWD criteria in the counties added in 2018 have not been in contact with the Department of Human Services (DHS) to report an exemption, or have been unable to fulfill work requirements, they have now lost their benefits. People in this situation can still have their benefits restored in April if they have been meeting an exemption or if they have been working, but need to contact DHS to do so. These restrictions are harsh and penalize individuals when they are at their most vulnerable. It is also important to note that it misunderstands how people use SNAP. According to a report from the Center on Budget and Policy Priorities, a majority of SNAP recipients work, but sometimes this work is not consistent. SNAP serves a dual purpose: it both provides short-term support for individuals during temporary periods of low income and a support for others with longer-term needs. These restrictions inhibits the program’s ability to do both. We are now hearing reports that President Trump and the House of Representatives are gearing up to make time limits on food assistance even harsher. It’s wrong and we won’t stand for it. The USDA has requested public comments on whether it should reconsider certain rules regarding the SNAP three-month time limit for childless adults. We must strongly oppose any administrative action that would expose more people to this cutoff policy. We need your help to generate comments from a wide variety of voices urging the USDA to not restrict waivers or pursue other changes that would cut off vital food assistance for many Oregonians. Our national partners at the Center on Budget and Policy Priorities have set a goal of getting 100 comments per state, so please comment and spread the word. Guidance on suggested language and how to comment can be found here. The deadline to do so is April 9th. We anticipate House Agriculture Committee Chair Conaway will release a Farm Bill proposal later in April that will impose harsher time limits on food assistance, including people approaching retirement and households with teenagers. The proposal would punish people struggling to make ends meet and takes away food assistance from millions of struggling households. It would end the traditional bipartisan nature of the Farm Bill. Instead of taking away grocery money from low-income Oregonians to pay for new risky schemes, we urge Congress to focus on policies that help create jobs and boost wages. Use our action tool to email your U.S. Representative and tell them to oppose any effort that would cut more people off food assistance. The SNAP Outreach team here at PHFO is excited to announce a new addition to our training toolbox!